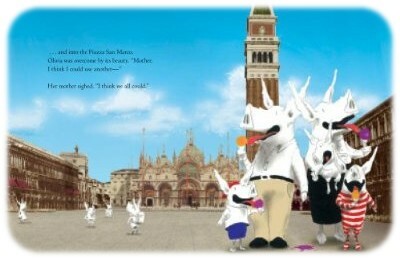 We are on our way to Italy in a couple of days and our trip will culminate with a few days in Venice. What better way to introduce such a place to children than through books? 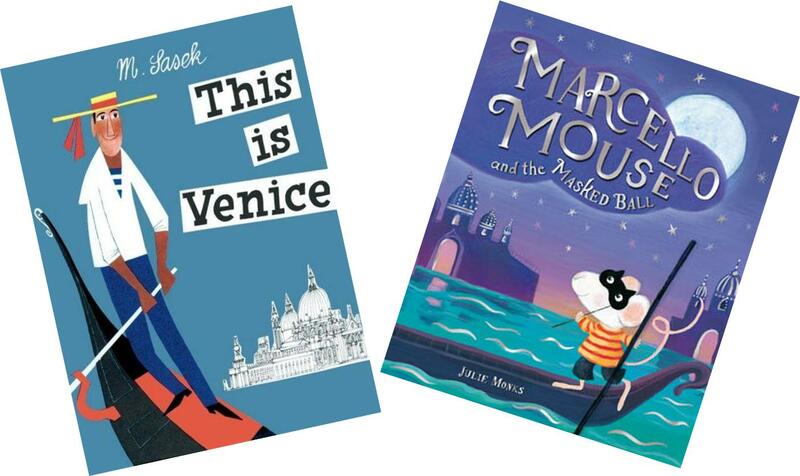 We have been reading two fantastic, albeit very different, books that have a have the floating city at their heart. If you do not know this piggy with huge amounts of panache yet, where have you been? 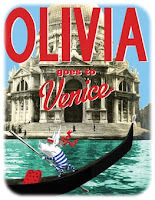 We love Olivia in the Library Mice household and were very excited to find out she was about to go to Venice, just like us. The joy of this new adventure from our feisty heroine although it has a story at its heart, it really reads like Kids’ Guide to Venice. I love the way Ian Falconer chose to mix media by juxtaposing drawing with photographs (a style which Mo Willems has down to a fine art in the Knuffle Bunny books). This really adds to the feeling of “tourist guide”, and it really works wonderfully, as it allows both for the fun of an Olivia story and yet still conveying the magnificence of the city. We follow Olivia as she encounters the sights and witness her first reactions to the grandeur of the city, from the Palazzos to Piazza San Marco, not to forget the Rialto Bridge from a gondola (and a particularly worn-out gondolier!). There was a sense of trepidation from my children once they had first read it. They, too, were raring to go and visit. And the great gusto with which Olivia consumes gelato did not go unnoticed and is quite simply hilarious. But of course Olivia cannot help being her mischievous self and creating a certain amount of chaos and the ending will have adults and young audiences in fits of giggles (after the initial shock of the realisation of what she has done – my children felt the need to check that that had not actually happened!). Well worth a read even if you are not planning on a Venetian trip, just for the fun of another Olivia story! Subtitled A Tale of Three Princesses, The Glass Heart is the beautifully illustrated gentle tale of three Venetian sisters who all have a glass heart. After the eldest dies of a broken heart and the second princess is bed-ridden with a crack in hers, the King is determined to ensure that his youngest daughter’s heart remains whole and unharmed. Therefore it is decided that she will only marry a prince who is good with glass. But the princess is already in love, with the kind and reliable courtier who looks after her. When he saves the princess’ life and is given his freedom by the King, he decides to go to a neighbouring island and learn the craft of glassblowing. But learning such a craft takes time, will the princess have waited for him when he gets back? The tradition of glass-blowing and the islands Murano and Venice take centre stage in this gorgeous fairy tale. 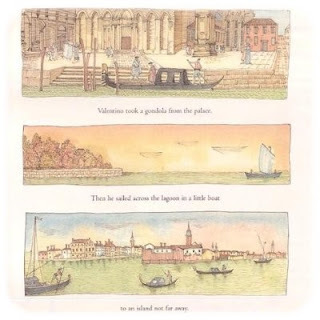 Sally Gardner’s splendid pastel illustrations are timeless and Venice’s romantic heritage really shines through, as well as its magic and enchantment. The Glass Heart is a story of love and devotion, and the happy-ever-after is not unexpected but still satisfying, withthe protagonists finding well-deserved happiness. 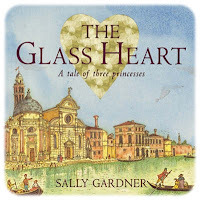 The Glass Heart offers a beautifully romantic and historical view of Venice, with some characters from the Comedia De’ll Arte make an appearance too. It also offers a lovely introduction to the traditional art of glassblowing which is linked mainly to Murano, another island in the lagoon, which we hope to visit during our stay there. The Glass Heart is a utterly charming fairy-tale of a quality that it seldom found in contemporary offerings in this genre. It will appeal to girls of course but I have to say my son was just as enthralled! My heartfelt thanks to Nina at Orion who managed to find a review copy of “The Glass Heart” for me. It is currently out of print, but is due for a reprint next year. In the meantime, it is available in public libraries!